When I sit down to write an article, I have a pretty standard routine. I outline the story in our Content Optimization System (COS), copy and paste it into a Google doc, find a good photo to accompany it, do research, write, proofread, and carry it back over to our COS. It's a weird series of steps that doesn't necessarily work for everyone, but it does for me. They're my very own personal blogging habits. Those habits aren't just limited to my writing process. I have morning, evening, and weekend routines, as if my entire life has become a series of established patterns. Knowing what those habits are, I learned during step four of the above, is a veritable goldmine for marketers. I figured that out from a 2012 New York Times article called, "How Companies Learn Your Secrets." Penned by Charles Duhigg, it was written largely as a follow-up to what became a public incident: An angry father marched into a Minnesota Target store, demanded to know why his teenage daughter received coupons for baby products, only to later find out that she was, in fact, pregnant. The retailer, it turned out, was able to predict her pregnancy and subsequently personalize the promotions she received, thanks in large part to a ton of (completely legal) data collection and analysis. Creepy -- or great marketing? The article details exactly what that information and accompanying process look like, and why psychology makes it easier for marketers to customize the messages they send us. But how does that work, and how have other brands put it into practice? We've dug a little deeper, and shared what we found below. To continue the above tale, we thought it might be helpful to share more information on how, exactly, the retailer pulled off the aforementioned personal prediction. As Duhigg explains in his article -- which goes into much greater detail than I will here -- every Target customer is assigned a Guest ID number after the very first interaction with the brand. That ID is used to store the customer's demographic information, ranging from ethnicity to job history, and to track buying behavior. And by doing the latter, specifically with those who had baby registries with the store, Target's marketing analysts were able to form a "pregnancy prediction" score, which allowed them to determine which purchasing patterns indicated a customer was in the early expectant stages. It was a game changer. "Once consumers' shopping habits are ingrained," Duhigg writes, "it's incredibly difficult to change them." That is, until, a major life event takes place, like finding out that a baby is one the way. That's when routines are forced to change. Suddenly, there's a deadline, and people start to buy products that they never previously considered, like "cocoa-butter lotion" and "a purse large enough to double as a diaper bag," the article says. Those are the behaviors that trigger Target's pregnancy prediction score, prompting the customer to receive special deals on baby-related items. Using data to predict a woman's pregnancy, Target realized … could be a public-relations disaster. So the question became: how could they get their advertisements into expectant mothers' hands without making it appear they were spying on them? How do you take advantage of someone's habits without letting them know you're studying their lives?" That's not to say that marketers should completely do away with personalization, as it's effective when done correctly -- personalized emails, for example, have a 6.2% higher open rate than those that aren't. But in an era with growing concern over privacy and security, tread lightly. Let your customers know that you understand them, without being intrusive. Curious to learn how to do that with your HubSpot Marketing and Sales software? Read more about how personalization tokens work here. He wasn't kidding. This particular brand could have just superimposed each recipient's name onto the whiteboard in this video and kept the same script for each one. But it didn't stop there -- Cole, the gentleman speaking in the video, not only addressed Kyle by his first name, but also referred to his specific colleagues and the conversations he had with them. Considering that the average online reader loses interest after about 15 seconds, personalizing your mixed media content is an interesting and often effective approach. "I mean, clearly he made the video just for me," Jepson said. "It's an interesting case study." And while this sort of personalization is memorable, it's also extremely time-consuming. So if you set out to create it, be absolutely sure you're targeting the right people. There's nothing worse than taking the time to produce something highly customized, only to find out you've sent it to someone who doesn't have the decision-making power you need. Back in 2011, Coca Cola launched its famous "Share a Coke" campaign in Australia, bringing it to the U.S. in 2014. It was an effort to reach millennials, in which each bottle contained one of the most popular first names assigned to that generation. Eventually, bottles contained semi-personal labels beyond first names, like "better half." Today, according to Ad Age, over 800 first names are used. According to that same source, Coke will soon be adding surnames to bottles, like Garcia and Thompson. "Last names give us an opportunity to invite more people into the campaign," Evan Holod, Coca-Cola's brand director told Ad Age. "It's just a great way to up the reach." In addition to that effort, according CNBC, Coca-Cola Great Britain will soon be including the names of famous vacation destinations on bottles, like Hawaii and Miami. The goal of that initiative is "to remind people of the refreshment and great taste that only an ice-cold Coke can bring on a hot summer day," read the official statement. Plus, those bottles will come with the chance to win a trip to those locales. Putting first names on Coke bottles was a successful move. In the U.S., it resulted in increased sales volume for the first time in roughly four years. Plus, it provides a cheap thrill -- I know that I internally squeal with excitement when I actually find a bottle that says "Amanda." The last name move, however, could be a bit different. 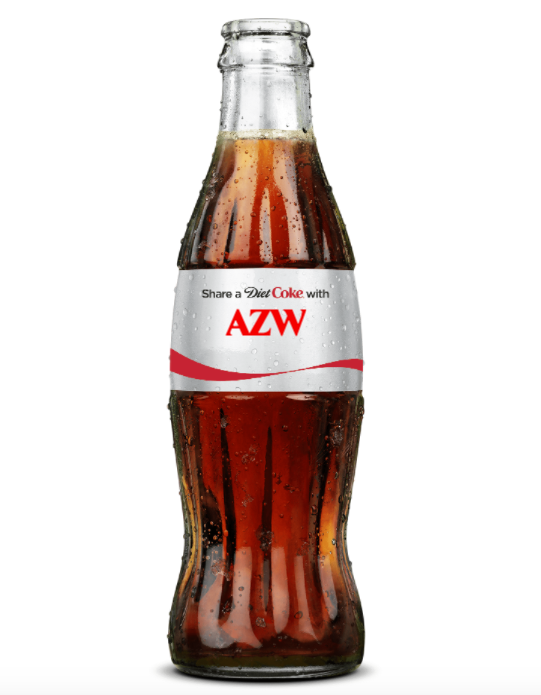 While there is the option to customize your own bottle labels at ShareaCoke.com -- which allows you to write whatever you want, like a customized event hashtag or something like "congratulations" -- it could be deemed as exclusionary to those with unique or hyphenated last names. For example, while my feelings aren't hurt knowing that I won't find a bottle labeled with "Zantal-Wiener," I'm not about to pay $5 for a customized one, either. So when you set out to personalize a product, make sure it's appropriately customized to reach the right segment of your audience, but isn't restrictive, either. Those who know me are aware of my borderline obsession with hip hop, which is also the motivation for a lot of my online shopping behavior. Clearly, Amazon has taken notice. And as I continued scrolling down, the fitting personalization went on. There was a header reading "For a night in" with recommendations on what to stream on Amazon Prime -- an activity that comprised the majority of my weekend. Its recommendations for dog and kitchen products were on point, as well. After all, those are the categories where I make the most purchases. It's not just me. When I asked my colleagues what their Amazon homepages looked like, they were equally pleased. Sophia Bernazzani, a fellow Marketing Blog staff writer (and self-proclaimed "cat mother of three"), had a plethora of personalized cat food recommendations, while Managing Editor Emma Brudner's suggested Prime streaming titles came with the header, "Bingeable TV." "Amazon," Brudner remarked, "You know me so well." Here's a personalization example where we don't have a ton of complaints. 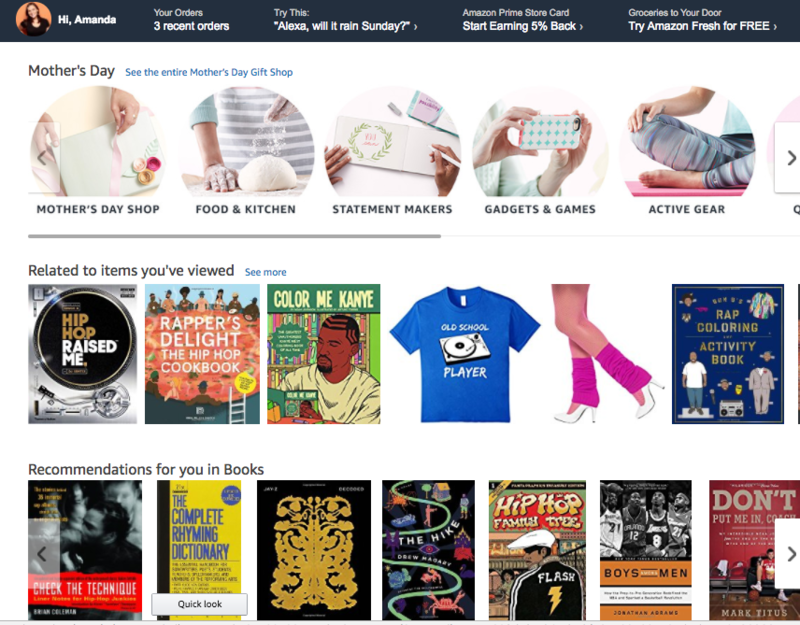 As Brudner said, Amazon seems to know us pretty well, though I do question why, as per the image above, its algorithm thought I might like to buy a pair of leg warmers. The nice thing about personalization of this nature, when it's executed correctly, is that it often can lead to unplanned purchasing decisions. For example, the purpose of my most recent visit to Amazon was to check out its personalization features for this article. But then, I discovered that Rapper's Delight: The Hip Hop Cookbook was in my recommended books. Did I buy something I don't need? Sure. But I also was left delighted by the fact that it was brought to my attention with very little effort. If you're in the business of personalizing curated items or recommendations for your customers, remember: The best part about it, for the user, is the resulting discovery of new things that we like -- whether it's a book, a tool, or an article. 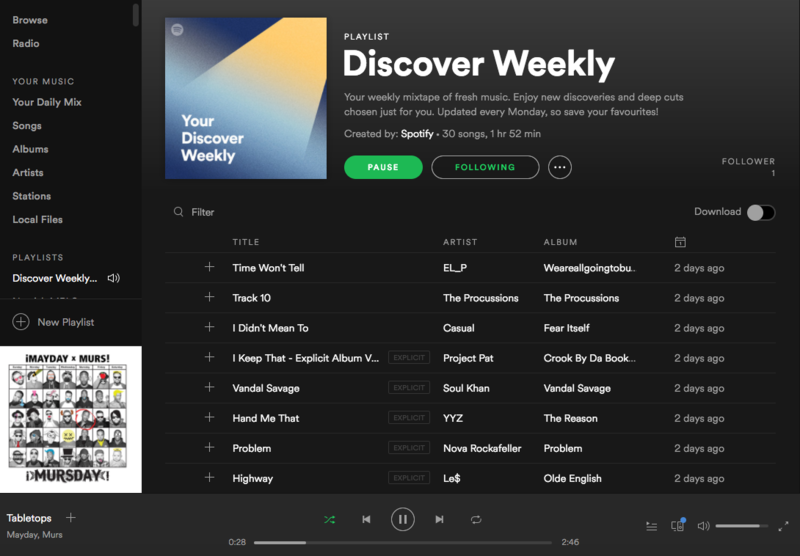 As much as I use Spotify -- which is close to daily -- I've never actually bothered listening to my Discover Weekly playlist. So after a colleague brought it to my attention, I decided to take it for a spin. The results were hit-or-miss. There were a few new songs that I was thrilled to discover and plan to listen to again. But for the most part, my experience was similar to Pasick's, who described many of the songs on his personalized playlist as "meh." But those behind Discover Weekly acknowledge that personalization isn't a perfect science. 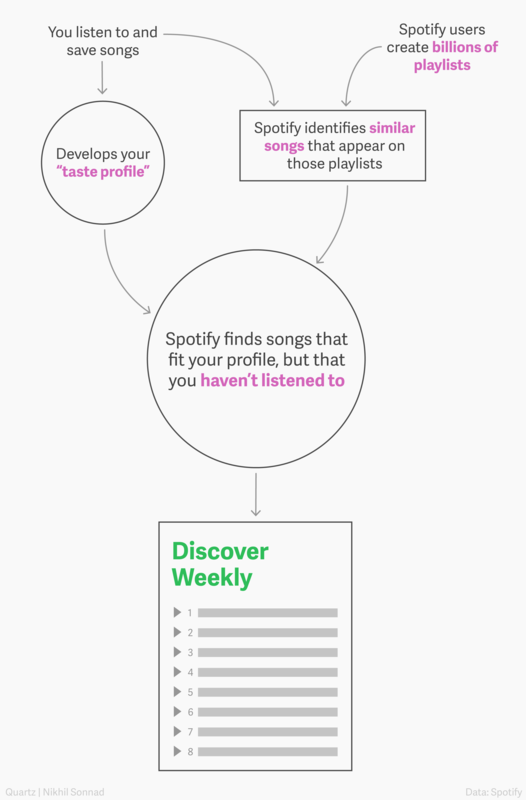 They also have suggestions for how to make it better, like adding the Discover Weekly songs you like to your library, or skipping the ones you don't -- "If users fast-forward within the first 30 seconds of a song," Spotify Product Director Matthew Ogle and Engineering Manager Edward Newett told Pasick, "the Discover Weekly algorithm interprets that as a 'thumbs-down' for that particular song and artist." Most personalization initiatives aren't going to be perfect. Even with a great algorithm, they are, at best, very educated guesses as to what's going to be applicable to your customers. For that reason, it might be best to take a conservative approach to your recommendations, especially in the earliest stages of any personalization efforts you make. This is an area where small-batch testing can be helpful. When you want to try out a personalization project or algorithm, identify your most active users, and invite them to pilot out the technology. Listen carefully to their feedback -- good and bad -- and see what you can do to make it better. During the 2016 holiday season, Iberia Airlines customers received emails posing the question: If you could visit any vacation destination, what would it be, and who would you go with? To answer, customers were redirected to a microsite where they would fill in responses, as well as the email address of the person they wanted to travel with. Not long after that, the friend would receive an email with a holiday greeting about the dream vacation -- only, in order to view the card, that person had to click a link to view it in his or her browser. It was that last step, Skift writer Brian Sumers explained, where "Iberia ... put its advertising budget to work, using cookies [with the user's permission] so the traveler's friend would see banners across the web, suggesting the perfect Christmas gift." That gift, of course, was the dream vacation. Let's say, for example, I sent one of these cards to a friend. She might subsequently see several ads while browsing that said things like, "It's never too late to fulfill Amanda's dream. Do it with a trip to Mykonos." Having enough data is essential for marketing personalization -- but knowing what to look at and how to use it is just as important. That's what made a tremendous difference for Twiddy, a vacation rental company based in the Outer Banks. "Unless we had a good way of looking at the data," Marketing Director Ross Twiddy told Inc., "how could we make good decisions?" One of the major pieces of information that Twiddy began to more closely examine was how rental volume and demand shifted from week-to-week. Noticing those trends allowed the company to start making "pricing recommendations" to homeowners, according to Inc., "on the basis of market conditions, seasonal trends, and the size and location of a home." The week after Independence Day was one that stood out to the team in particular, in that rentals showed a precipitous drop during that period. Because Twiddy observed that trend (among others), it allowed the owners of its managed properties to start experimenting with pricing for that particular week as early as January. Not only did it benefit the customer -- setting more realistic prices for lower-demand periods actually increased the bookings made for them -- but it was just one way that Twiddy was delighting its customers with helpful, actionable information. It paid off, too. Since the brand began to use this data to help homeowners with decisions like pricing, its portfolio increased over 10%. There's a famous saying that goes, "Help me help you." Data, in general, can be a tremendous asset to brands. And it doesn't have to be about your customers' behavior -- it can be about the habits of their customers, like the vacationers that rented from Twiddy's homeowner clients. As long as it's something that can be shared ethically -- like objective buying or seasonal trends -- share the data and insights with your customers that's going to help make them more successful. That's the type of thing that makes a brand remarkable, and can help benefit your business, too. One of the fundamental purposes of any personalization effort is to let your customers know that you're paying attention to them. But striking a balance between, "We think you might find this helpful" and "we're watching you" isn't a simple process, so be sure to do some careful research, planning, and testing before you jump into any large-scale customization initiatives. Remember that while you might be a marketer, you're also a consumer. When it comes to experiments like these, put yourself into the shoes of the customer and ask, "Is this delightful? Or is it just creepy?" If it leans toward the latter, find out what's giving it that vibe, and try something different. What are some of your favorite personalized marketing examples? Let us know in the comments. This post was originally published in December 2013 and has been updated for accuracy and comprehensiveness.